I have been so impressed with the level of professionalism and expertise demonstrated by Pindar Creative. Having used them for the creation of our timetables and maps for several years they were the natural choice for such a large and important project. The entire team (from the cartographers to the print managers) have been a credit to Pindar Creative and I am sure without their combined efforts, attention to detail and proficiency this launch would not have happened within our tight deadlines or have generated such positive feedback from our stakeholders and customers. 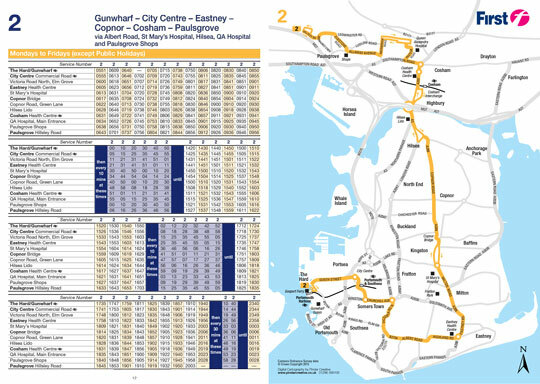 In a move designed to increase bus usage in East Hampshire local bus operating company First Hampshire and Dorset decided to redesign its entire East Hampshire Network. 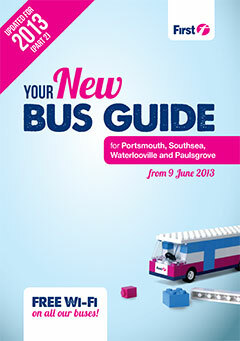 The changes, which took effect from Sunday 18 November 2012, affected almost every route in the city of Portsmouth and in Fareham, Gosport and Waterlooville, with most existing routes changing. New service numbers were also given to the newly created routes. The scale of the changes was extensive with services being distilled down from 45 to a core of 26, all designed to offer a more effective service meeting the needs of the majority of their customers. This also meant there was a need for new travel information to back up and support these changes. First Hampshire & Dorset turned to Pindar Creative to assist with this task. They urgently needed a complete new set of timetable books showing individual route maps for each of the 26 new services. On top of this the new routes needed combining to create a new network map. The urgency of the project was such that the routes were still changing as the mapping and timetable work was being done so several iterations were produced and proofed before the final version was achieved. Pindar put all their available staff on the project in order to meet the tight deadlines and provided an extensive internal proof reading service to ensure the accuracy of the data being published. Proofs of the new routes were sent to First Hampshire & Dorset prior to printing so that the drivers could check their validity and add any detail that only they might know. Once approved the artwork was signed off and hit the printing presses. The artwork design was cleverly colour coordinated so that every route, whether shown in a timetable or on a map, retained the same colour scheme making it as clear as possible for customers to understand the new network changes. An additional timetable booklet was also created for the South Downs College which detailed the routes serving the college itself.